Have plans for Halloween yet? Now you do. The spookiest time of the year is almost here and we’re calling all ghosts, goblins, and ghouls for a spooktacular Halloween party at Roller Kingdom. 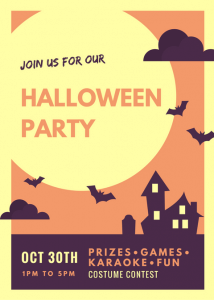 Costumes are optional, but we encourage you to wear your scariest, funniest, and silliest costumes because you could be the next winner of our annual Halloween costume contest!!! We can’t wait to see the creative and unique costumes that our skaters come up with as they join us for our annual Halloween Party at Roller Kingdom!